Lotus Flower: First cooking lesson! 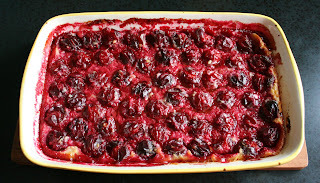 On Tuesday, C and I made a plum clafoutis. 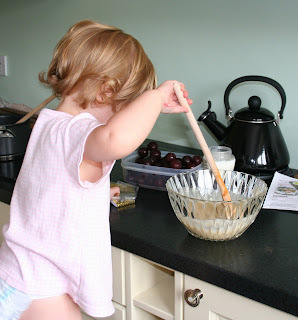 She loved watching me break the eggs, and then she loved stirring the liquid dough. She didn’t want to stop. If I had let her, we still wouldn’t have a cooked clafoutis. I felt a surge of pride about the fact that she was keen on cooking/baking, and a sense of nostalgia about when my mum and I used to bake together. I never liked cooking the starter or the mains, but the dessert, ah yes, I was always there for the dessert! And most specially for licking the large wooden spoon from which the dough was still dribbling (I always made sure there was lots left on the spoon after pouring the dough into the dish! ), and then making my finger slide all around the bowl, till the last drop. C didn’t propose to lick the spoon or dip her fingers in the dough, so I didn’t encourage her. There is plenty of time for that! Sharing this kind of thing with a daughter – is there anything like it? Passing on your savoir-faire, your experience, your tastes, your preferences, subliminally at first, consciously much later – I think that’s what having children is all about. That, and passing on your love of them and your love of life. So that they can pass it on too – hopefully.